Prime Minister Binyamin Netanyahu alluded to Israel’s bombing of a Syrian airbase Monday, saying that Israel reserved the right to use preemptive strikes against threats to its security. 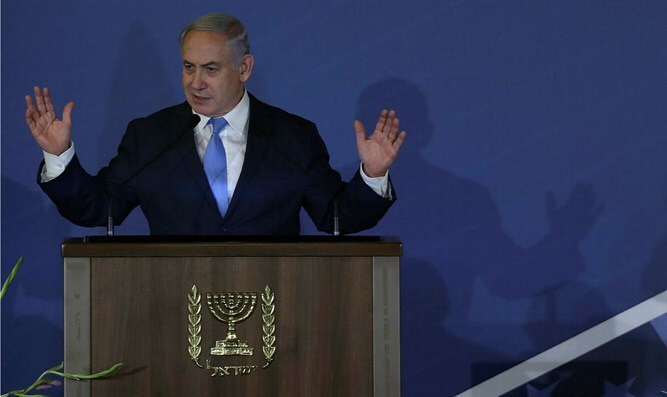 Speaking at an event in the southern Israeli city of Sderot on Monday, Netanyahu discussed Israeli security in the shadow of violent protests along the nearby Israel-Gaza border, and to Israel’s north, in Syria. "The first thing that is happening here may be summarized in one word – security: Security for Sderot, security for the area adjacent to the Gaza Strip, security for the Negev, security for Israel, security in the future." The Prime Minister subtly referenced Israel’s recent bombing of the T-4 airbase in central Syria in a predawn attack Monday, though IDF officials have yet to acknowledge Israeli involvement. We have one clear and simple rule and we seek to express it constantly: If someone tries to attack you – rise up and attack him," said Netanyahu, referencing the Talmudic dictum of “when someone plans to kill you, get up early and kill him first”. Earlier on Monday, both US and Russian officials said Israel’s air force was behind the bombing of Syria’s T-4 airbase, which according to the Syrian Observatory for Human Rights left at least 14 people dead, including ‘foreign nationals’, which the Tehran regime confirmed were Iranian personnel. The Kremlin claims that two Israeli F-15 fighter jets entered Syrian airspace via Lebanon, and bombed the T-4 airbase. The attack comes just days after a sarin nerve gas attack in the city of Douma, east of Damascus that killed dozens of civilians. Some estimates placed the total number of dead at 150, while other reports range from 60 to 80 dead. Israeli forces bombed targets in and around Syria’s T-4 airbase two months ago, after an Iranian drone controlled from the base entered Israeli airspace. The incident prompted an Israel reprisal on the base, during which an IAF F-16I was shot down. In his comments Monday evening, Netanyahu also referenced the recent riots on Israel’s border with the Hamas-ruled Gaza Strip. "We will not allow, here on the Gaza border, them to hurt us. We will hurt them. Security in the present is a necessary condition for security in the future and what we have here today is a powerful expression for our future security." Since Friday, March 30th, violent protesters in the Gaza Strip have amassed on Israel’s border, clashing with Israeli security forces in riots that have left roughly 30 Gazans dead and hundreds more wounded. Israeli sources say 12 of the dead have been identified as Hamas terrorists, and that armed terrorist elements in the Gaza Strip have used the riots as cover to attempt terror attacks on Israeli forces.